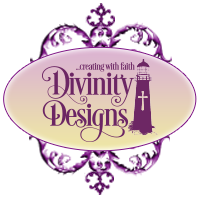 Divinity Designs, LLC Blog: Customer Card of the Day - Marlena McDeavitt! Customer Card of the Day - Marlena McDeavitt! Happy Wednesday, everyone! Each week I have the honor and priviledge of revealing another gorgeous ODBD creation for Customer Card of the Day.....I love my job!!! 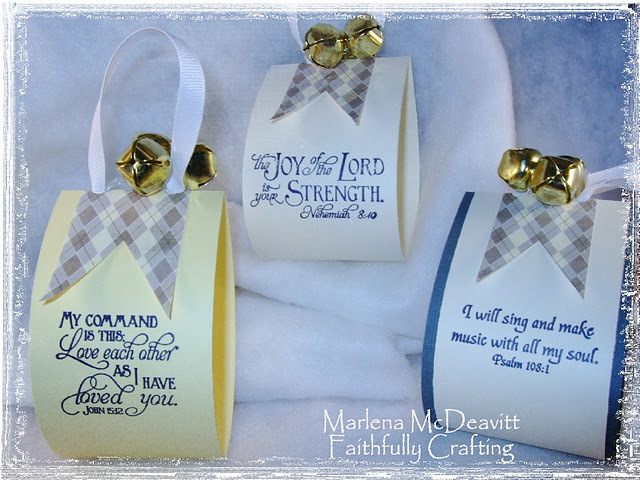 This week's feature is not a card, but some super clever and gorgeous "Memory Verse Ornaments" by Marlena McDeavitt.....way to go, Marlena!!! I was so tickled to discover this post on Marlena's blog.....perfect to feature here today!!! Most of us are on the look-out for cute and clever ideas....check out Marlena's easy instructions on how to make these adorable ornaments! The beautiful scripture verses she chose are from "Scripture Collection 6" and "You Will Find Refuge". Grab yourself a cuppa and head to Marlena's blog, Faithfully Crafting, to see more of her beautiful creations! Marlena has such a creative and artsy style; her blog is full of cool techniques and clever designs, but what I love most is how she explains the thoughts and meanings behind each project. Thanks, Marlena, for your inspiration!!!! Thanks so much for visiting today! Stay tuned tomorrow for a brand new Stamping in Time: On Assignment Challenge with Betty Wright! God bless!! I love the little ornaments. That same idea or similar would make a great table setting. These are beautiful. Marlena, those are so beautiful and clever!! these are so cute. all dressed up.